Is this Greyhound going to the dogs? You can wait a year for FirstGroup's annual results to arrive, and then two whopping great losses come along at once. With that, the man at the wheel, American chief executive Tim O'Toole, has been turfed off the bus by his chairman. We aren't actually told O'Toole's been sacked, but they haven't left much doubt. When the departing driver says he's "clearing the way sought by our chairman and board", it kind of implies that he was seen as a blockage. There's no new chief executive lined up, so this may have been done in something of a rush. Chairman Wolfhart Hauser steps up to an executive role (both driver and conductor?) while handing some of the chief executive's job to Matthew Gregory, the chief operating officer. In operations - if you cut out all the nasty stuff - the Aberdeen-based transport giant is turning a pre-tax profit of just under £200m. It is still trundling round its UK city bus routes, which saw a modest 1% increase in revenue last year. British trains are not much of a pleasure for anyone to be running these days. FirstGroup has the Great Western franchise, and last August, it took on South-Western trains, which helped boost its revenue by 13% to a total £6.4bn. After the Stagecoach/Virgin financial derailment on the East Coast line, the Aberdonians are now admitting that they overbid for TransPennine Express. This was in the hope that the UK government's rhetoric about a Northern Powerhouse would boost travel times and passenger numbers between northern English cities. That was under previous management in Downing Street. Now, in a bid to throw the kitchen sink at the annual accounts and citing "onerous contractual provisions", FirstGroup is rolling up all its future losses on TransPennine for the rest of the franchise, and writing off £106m. But the biggest financial pain is being felt in North America, where FirstGroup derives around 60% of its revenue. It is the biggest operator of yellow school buses, those classic symbols of the All-American childhood. That brought in £1.8bn in revenue in the year to March. But it's a tough business, and First Student has been trying to move up from the low margins on which it gained market share. The past year saw disruption due to severe weather, and rising costs due to driver shortages. First Transit provides other North American bus services and has revenue of nearly £1.1bn. One contract it recently lost is causing pain in that department, because it was a high-margin shuttle service for workers in the tar sand oil fields of Canada. 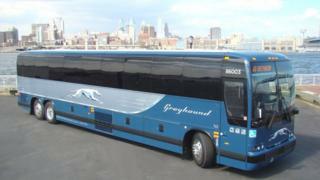 FirstGroup's other icon of the Great American open road, the Greyhound coach, is limping badly. When the oil price tanked from 2014, it lost passengers. They got in their old gas-guzzling clunkers and drove the route themselves. Those gasoline prices are up again, but now the problem is low-fare airlines, which are growing aggressively in the US, and working new routes which compete directly with Greyhound. So FirstGroup is reducing the "goodwill" - that's the intangible value of the business and brand - by £277m. So there's another big blow to this year's results, taking the statutory pre-tax loss to £327m. When Wolfhart Hauser says the firm is "examining all appropriate means" (tell us about the inappropriate ones, Wolfie) to turn things round, Greyhound is getting "a full external review of its business model and prospects". That's usually code for a looming sale, or failing that, a swingeing cut to its route map. It begins to have the feel of that closing scene in John Schlesinger's film Midnight Cowboy, with Dustin Hoffman's character Ratzo Rizzo dying in the back of a Greyhound bus from New York to Miami.